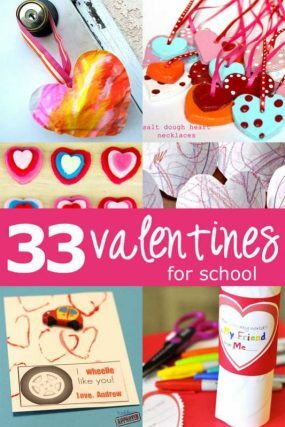 A learning Valentine craft for kids to this Valentine’s Day! String up some pretty (and easy!) hearts to your dining room chandelier and it’ll set the mood with every meal. 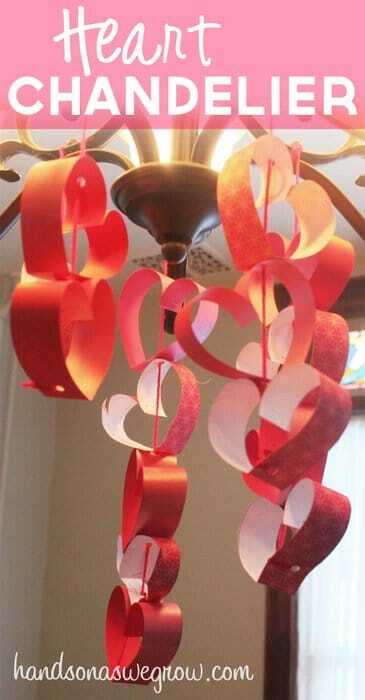 I cannot tell you all the levels of learning that Henry worked on when making this chandelier of hearts. Just to name the obvious ones! 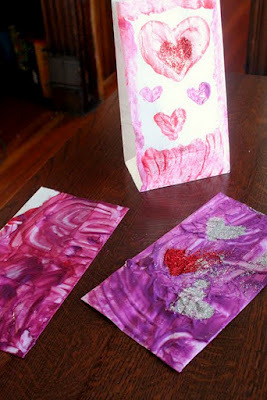 I took a two pieces of 12×12 scrapbook paper (in Valentine’s day colors). I used a ruler and drew approximately 1 inch strips on the back (I just used the width of the ruler to make it easy). 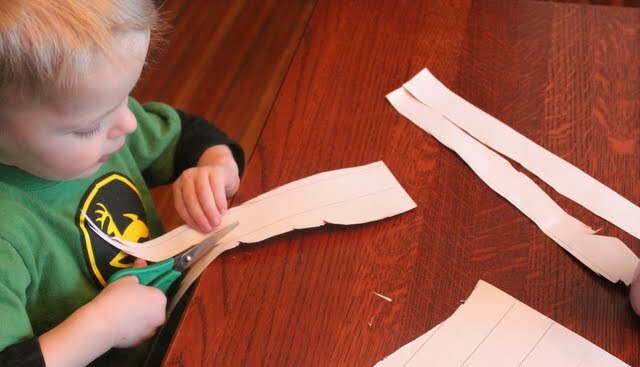 Henry cut the strips from one paper, while I cut out the other. His were a little jagged, but that’s what makes it great! He did well following the line, and even went back to ‘touch it up’. 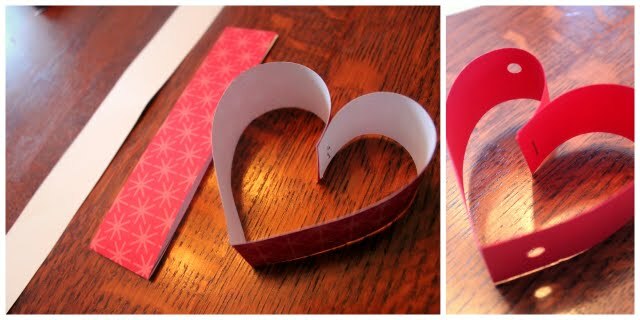 Fold the 1 inch strip of paper in half (right sides out). Bring the end together (right sides together). Punch a hole at the top and bottom of the heart. Thread some yarn of a corresponding color through the holes. That’s it! Repeat it until you get all your hearts made. Henry did all the steps at least a couple times himself. The hole punch was a little tough for him to squeeze, so he needed a little help with that. And I, of course, did the stapling. Next, thread the yarn through the holes. We started at the top of the hearts and went to the bottom. 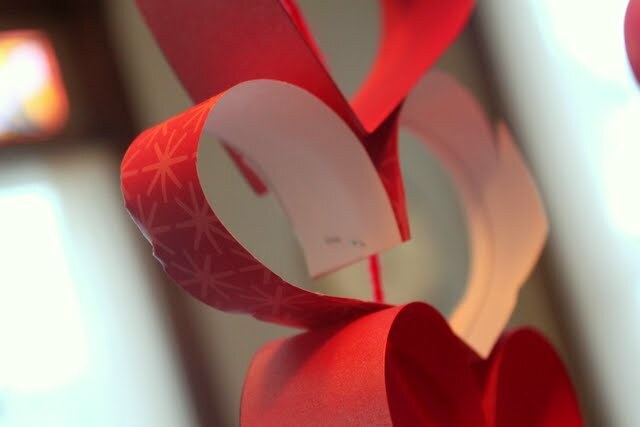 When we threaded on enough hearts, I tied it off around the bottom of the heart. I then cut off the yarn and tied it to my chandelier. Henry did 100% of the threading. Henry did 100% of the counting of hearts. Henry even did sequencing. He started with the string of five hearts. Next was 4 hearts. And so on. He figured out how many should be on the next string. We did a string of 5 hearts, 4 hearts, 3, 2 and 1 heart. Henry also did 100% of the patterning. Red heart, ‘snowflake’ heart, red heart, etc. I can’t believe what a different a year makes. 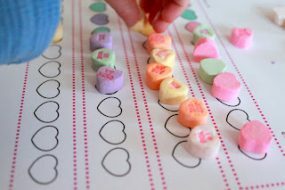 Last year for Valentine’s Day, I tried a patterning activity, just to see if Henry knew about patterns. He wasn’t there yet. But this year, he did it completely on his own. I’m so proud of how much he’s been learning! Such a difference a year makes! Definitely! What a beautiful craft the 2 of you made together…and I’m sure he loved every moment of that special time! 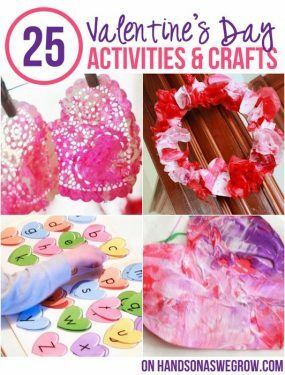 I loved this idea so much that I made a long garland of hearts using red, pink, and white construction paper. I strung them up on a string with beads in between. I have hung it above my sliding door to the backyard, but the way I punched the holes most of the hearts sit upside down. Back to the drawing board I guess. I plan on doing some more experimenting, including making a string for the chandelier over my dining room table. 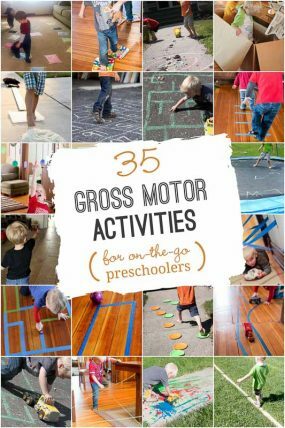 This looks like a perfect afternoon activity for me to do with my son. I really like this. I've got my daughters doing it right now! thanks for the idea. These look great, Jamie! Think I'll get my students to make some for our classroom. This looks lovely! What a wonderful way to decorate. Looks awesome! I totally agree a year makes a huge difference! 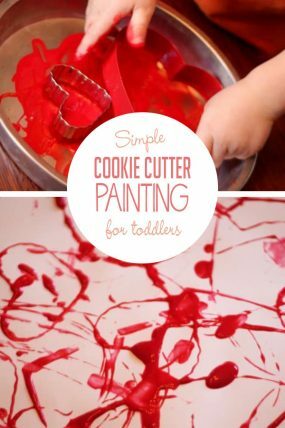 I can't wait to try this with my three year old! These are so pretty! My girls would love this!